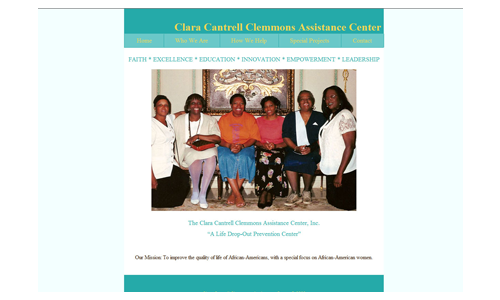 The former Clara Cantrell Clemmons Assistance Center (CCCAC) website used a webhost template but they wanted to switch to a customized solution that would better fit their needs. I guided CCCAC through organizing their content into sections and pages to ensure that information was easy to find and the website was simple to navigate. The organization did not have an existing brand identity in place so I selected shades of neutral pastels that would appeal to the organization’s main target audience (women) without alienating other potential visitors. 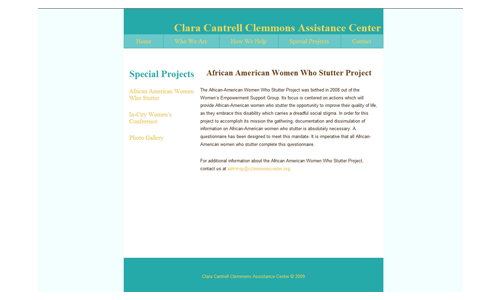 The website was built with HTML and a separate CSS file to offer the possibility for colors and elements being altered to accommodate future branding efforts. Art direction, image editing, info architecture, visual design, & website build.